The 1940's Avengers Assemble in a Classic Warner Brothers Gangster film for a new generation! In 1949, as Mafia Crime Lord Mickey Cohen's (Sean Penn) wave of terror continues to grow throughout Los Angeles, a special unit of L.A.P.D's finest, lead by Sgt. John O'Mara (Josh Brolin), are assembled to end Cohen's reign once and for all. Can the newly conceived 'Gangster Squad' get the job done by cleansing the streets of the criminal underworld and all making it out alive? As someone who loves watching those old black and white films featuring the sharp talking and even sharper shooting gangsters, it's a mixed bag for me. There is a nagging part of the back of my mind saying that this isn't what I want to see, mainly because of the modern filmmaking techniques used; It's odd seeing this very familiar world through the lens of a dynamic moving camera and the occassional Guy Ritchie Sherlock Holmes inspired slow motion shots. It also feels a lot less authentic being shown through a digital projector rather than on film, and strangely enough, in colour! Being shot in 3D would have been a big nail in the coffin for me, so I'm very glad that the filmmakers and the studio chose not to do that. Apart from that though the film gets it pretty much right, delivering exactly what I wanted to see (although I have a few mixed feelings about the ending, I'll leave them out to avoid spoilers). With the focus being on good ol' fashioned characters, the cast also does a fantastic job, with an ensemble of modern acting greats taking on the classic style approach and pulling it off. Sean Penn gives a menacing performance as Mickey Cohen, a man who through Penn comes across as a very wild and dangerous presence. Josh Brolin leads the squad very well and feels very much at home in this environment, as if he were from the era himself. The ever-wonderful Emma Stone looks the part as the stunning female presence, but it's not a character that is explored too much, understandably so within the time frame of the film however (albeit a lot more developed and significant than you may expect). Heartthrob Ryan Gosling continues to break hearts as the quintessential pretty-faced cool guy, playing a character somewhere between his roles in Crazy, Stupid Love and Drive - an expert in women and violence! He plays the role well and provides a great screen presence, but would have benefited if he only had a bit more Drive to his performance, especially for in this sort of film. Ryan Gosling charms the pants off of Emma Stone, and everyone else (admit it men, even you!). Speaking of not having enough Drive, the film on the whole does play it a bit too safe for my liking, especially in terms of the narrative - the story on the whole is too simple and generic. I'd have perhaps liked something a bit more ambitious to really make the film stand out as something special, however having said that, sometimes there is nothing wrong with being completely average! 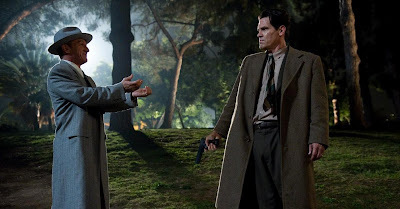 In being a film that is so generic, Gangster Squad does become a loving tribute to those gangster films, and the fact of the matter is that that is what I wanted to see. Had the film strayed away from that then I'd have probably felt even more disappointed, because what I really wanted to see was those 1940s men, in their 1940s cars, with their 1940s suits, in their 1940s world! From that perspective the film delivers in being very aesthetically pleasing big time, and spending time in that world is just a pleasure and a hell of a lot of fun. At the end of the day the film is nothing new, and it certainly won't change your world, but it's not trying to; it's a very enjoyable romp, and for those who love this period and genre they will love it even more-so for it. What's very interesting about this film's historical context aside from it's 1940s 'based on true events' story, is the more recent history of the film itself that makes it a significant piece of our time. For those who don't already know, Gangster Squad was initially set for release last September, with a pivotal scene featuring a shoot-out in a cinema. However being a Warner Brothers film, as was The Dark Knight Rises, in the wake of the tragic cinema shooting in Colorado, America last summer the scene was cut and rewrote, with all trailers featuring footage from the scene immediately retracted. It's a sad piece of history that won't soon be forgotten, and this film will last as a reminder of it. The scene re-shot in question is now set in Chinatown instead, and provides one of the more cinematic and extravagant settings of the film - in fact if I wasn't any the wiser I'd have mistaken it for a scene intended to be there from the start. 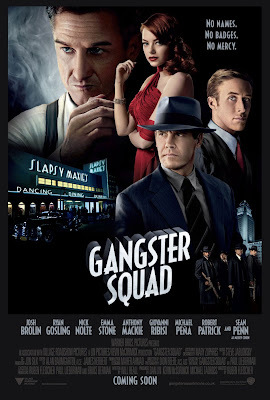 The sad truth of it all is that Gangster Squad will go down in cinema history, but for all the wrong reasons. The Chinatown scene won't soon be forgotten in the greater context. Gangster Squad takes the old Warner Brothers classic Gangster film formulae and reinvents and updates it for a new generation. It may not be a perfect film but it is certainly a lot of fun, and what the film lacks originality it more than makes up for in satisfying expectations by delivering everything that you'd possibly want and expect from the Gangster piece. 1940's sounds and surroundings, a great ensemble of actors, Thompson submachine guns, shoot-outs, dancing girls, booze, cars, suits, fedoras, gangsters and squads - what more could you possibly ask for in a film like this!? Gangster Squad (certificate 15) is released in cinemas across the UK on January 10th. Are you looking forward to Gangster Squad? Have you already seen it? Agree or disagree with my review? Leave your thoughts and opinions in the comments section below!